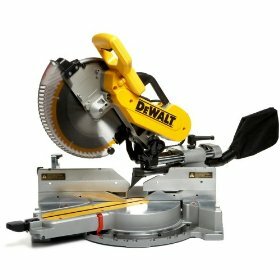 Are 12" DeWalt Miter Saws For You? Find Out Now. Aptly named 'Heavy Duty', 12 Inch DeWalt Miter Saws are known for their power, precision, and reliability. In fact, these heavy duty double bevel sliding compound miter saws are one of the most well known products to have come out from DeWalt. Let us take a look at its features, advantages, disadvantages, and more.
.	12 Inch DeWalt miter saws have a powerful 15 amp motor which is capable of 3600 RPM (rotations per minute) without load. The motor is very durable. It is one of the reasons why these saws are called 'heavy duty saws'.
. There are four bevel stops - 0°, 22.5°, 33.9°, and 45° - in both directions.
.	Dual horizontal steel rails and linear ball bearings for improved sliding mechanism. The setup process is really simple. You need to do some minor adjustments here and there and, if you are experienced, it will not take you more than five minutes. However, if you are a novice, it could take you some time. To avoid this, you need to make sure you read the manual carefully. A lot of people complain that these saws do not work properly without having the slightest idea of how to use the different features in these saws. The laser system in 12 Inch DeWalt Miter Saws is quite good. It works even when the saw is not triggered. It illuminates the entire cut range of the saw which makes it easier for you to cut precisely the way you want. A lot of reviewers have mentioned that this particular feature improves the accuracy of the cuts tremendously. Almost all the reviewers agree with the fact that the overall build quality of 12 Inch DeWalt miter saws is excellent. Despite having what they call a heavy duty motor, these saws are surprisingly quiet. The saw brake is really good. You can use it to stop the blade any time you want. It stops the blade unbelievably quickly. The blade guard is quite good as well. So, 12" DeWalt miter saws are relatively safer to operate than some other models available on the market today. The saw weighs in at 53 pounds, which is quite heavy, but is not as big as most people think. It has a neat, compact design which saves a lot of space. There is an inbuilt carrying handle, but you can always go for a cart or stand if you want. A lot of people say that the miter scale is not up to the mark. It is difficult to adjust to ¼ or ½ degrees. The bevel lock is placed way too close to the motor which makes it difficult to get a good grip on the bevel lock handle. The cam lock handle is a little hard to use. The dust bag is very sloppy. The table is pretty small. For a 12" saw, a lot of people expect a larger table. The rails are also smaller in size. They are just about an inch in diameter as opposed to the rails in most other models which are 1 3/16" in diameter. So, despite what the manufacturer claims, the sliding mechanism is not as smooth as one would imagine. On the whole, 12 Inch DeWalt Miter Saws have their share of both advantages and disadvantages. Return From 12 Inch DeWalt Miter Saws Page to Home.